Copyright, 1891, by T. B. Harms & Co. Written and Composed by Wm. J. Scanlan. So light her tread, so fond her gaze. 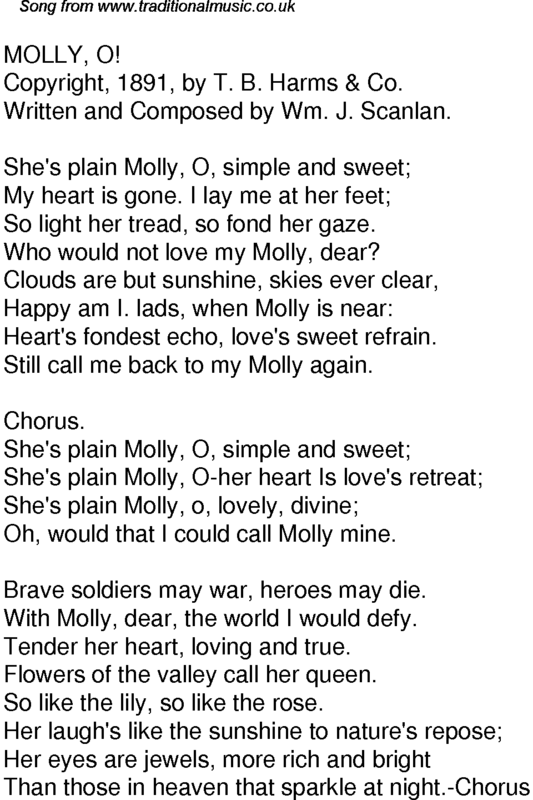 Who would not love my Molly, dear? Heart's fondest echo, love's sweet refrain. Still call me back to my Molly again. Oh, would that I could call Molly mine. Brave soldiers may war, heroes may die. With Molly, dear, the world I would defy. Tender her heart, loving and true. Flowers of the valley call her queen. So like the lily, so like the rose.